The Famous Smokey Bear Restaurant, Delicious, Affordable Home Cooking. 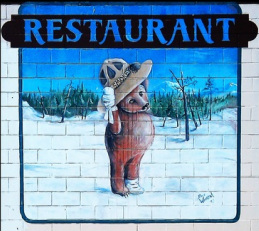 The Smokey Bear Restaurant has been the location of a number of movies. It is located at 310 Smokey Bear Blvd. in Capitan, New Mexico (next to the Post Office), and still a local favorite. Home cooking and a friendly relaxed atmosphere draw people from around the country. When in the area a visit to the Bear is a must. Maybe your mom might be able to serve a better breakfast, lunch, or dinner, but unlike your mom the Bear is open seven days a week. The prices are very affordable. You can try other places to eat, spend more money, and endure disappointment or you can just drop by the Smokey Bear Restaurant for good eats and good times. Capitan is home for Smokey The Bear Museum and some residents say that Billy The Kid's ghost still lurks around these parts. There are more than just a few area attractions to keep visitors here for a wonderful and exciting adventure as they explore old west history, Trinity Site (the first atomic bomb), ancient lava flows (Valley of Fire ) and more. So don't waste your valuable time looking for a place to eat when the Bear is just next door.